And by opposing it, feed them. I hope William Shakespeare doesn’t mind me modifying his famous lines a little, but you get the idea. When winter arrives, we see the birds all fluffed-up out in the cold and wind and snow and feel the need to “save them,” or at least make their lives easier. For the most part, birds are perfectly capable of dealing with the weather and finding food. Most of the birds that are not able to cope have long since migrated south for the winter. Therefore, we mainly feed birds for our own benefit. It provides an opportunity to view birds up close, watch their behavior, and have a sense of doing our part for nature. There are positive and negative things about feeding birds. On the negative side, there is the way feeders concentrate many birds in a small area, making it easier for diseases to spread among the population. The concentration also might make them more susceptible to predation. Drawing birds closer to your home can make them susceptible to window collisions. Feeding birds can also attract unwanted animals like rats, pigeons, English sparrows, European starlings, raccoons, and house cats allowed to run outdoors. I think the greatest benefit to feeding birds is the connection it provides between people and nature. In a society when people have become much more distanced from nature, feeding birds is perhaps the simplest and easiest way to make that connection. This important link to nature far outweighs any negative impacts of bird feeding. For instance, one additional benefit is the opportunity to get involved in citizen science projects. 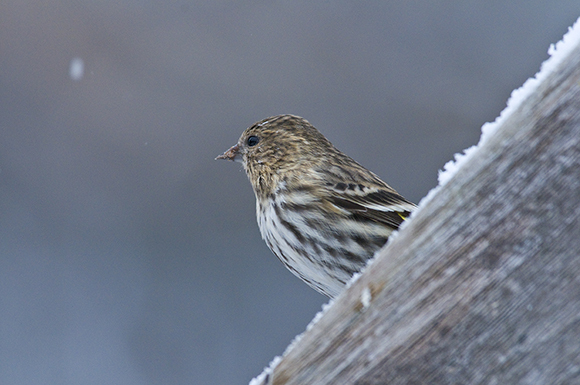 The Cornell Lab of Ornithology in New York has a Feeder Watch Program that allows members of the public to collect important population data on birds visiting their yards. It is also possible to reduce negative impacts by following a few general rules. 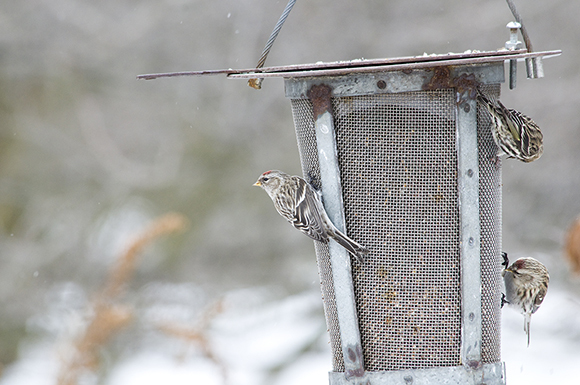 Generally, feeding birds above ground in some type of feeder is better than placing food on the ground. This will limit the number of mammals that are attracted to the feeding station. The type of feeder can limit the size and types of birds you want to feed. Tubular feeders with small (or no) perches tend to prevent large birds from accessing the food. Tubular thistle feeders have very small holes designed to provide access to the small thistle seed, limiting use to species like goldfinches, siskins, and redpolls. Applying any of a number of guards to the pole or line that supports the feeder can prevent mammals like squirrels and raccoons from getting to the feeder. 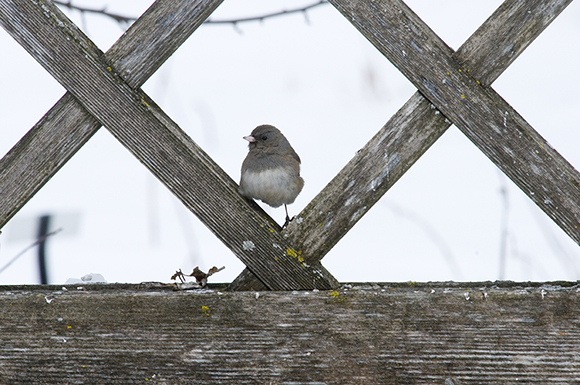 If you do want to place food on the ground for ground-feeding birds like juncos and tree sparrows, place only small quantities of seed on the ground so it gets used up before the end of the day. 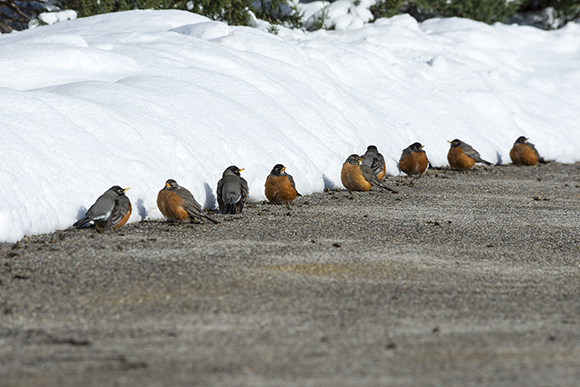 Robins (Turdus americanus) warm themselves on sun-heated pavement. It is also important to think about cover for the birds. It is better to place a feeder where birds have access to some type of cover, like shrubs or evergreens. This gives them an escape route if predators—like hawks—show up. Trees and shrubs can also moderate climatic conditions around the feeder. Keeping feeders reasonably clean is also important when it comes to reducing any disease problems that might occurs as you draw more birds to your yard. This is particularly important for tubular feeders, where birds are in much closer contact with the feeder. Washing with a weak bleach solution periodically is recommended. What kind of food should you provide to the birds? Almost every study I have ever seen has found that the small black-oil sunflower seed is the seed preferred by the greatest variety of birds. When a seed is preferred by more species, there is less seed that gets wasted or scattered on the ground to attract unwanted birds and mammals. 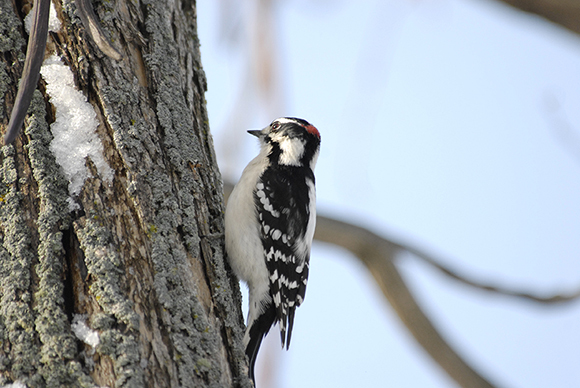 Although woodpeckers will also use the small sunflower seeds, they much prefer suet feeders. When shopping for suet, try to find brands that are primarily animal fat with few other ingredients like corn, millet, or milo seed. Some ingredients that are beneficial are peanut pieces, hulled sunflower seed, and pieces of fruit. Generally, suet feeders do not have perches, so this limits the birds that can access the food. (One exception is the European starling that can be a problem on suet feeders. I have found that placing suet on the underside of a board allows access to woodpeckers and nuthatches, but makes it much more difficult for starlings to hang on.) Another benefit of suet is that it provides food for migrating birds that may have remained behind for various reasons. 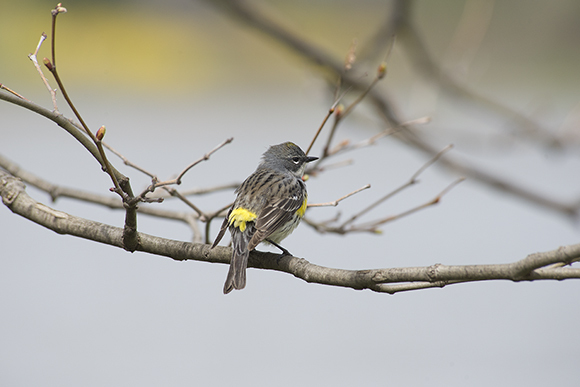 We have a yellow-rumped warbler visiting our suet feeder on a daily basis. 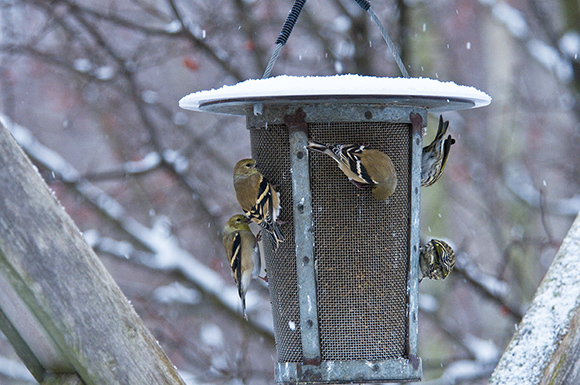 Thistle seed is especially attractive to a variety of winter finch species. Because of its small size, it generally requires using specially designed feeders that cater to small finch species. In most cases, the cheaper brands of mixed seed often contain unpreferred seeds that serve as fillers in the mixes. It is better to avoid these, as they can produce increased waste grain that can attract unwanted guests. Water is another good thing to provide for birds in winter. Obviously, most water sources are frozen, so it is necessary to use a bird bath heater to keep water open and available in the cold. Another nice thing about water is that it will attract birds that might not normally visit a feeding station, especially as temperatures warm up. Some people who have kept a species list for birds visiting their yards have found that their list more than doubles once water is provided. One last point to keep in mind is that the appearance of birds at your feeder can change due to fluctuating weather patterns. If we experience a period of mild weather, the birds may be off finding naturally available food and not find it necessary to come to you feeder. 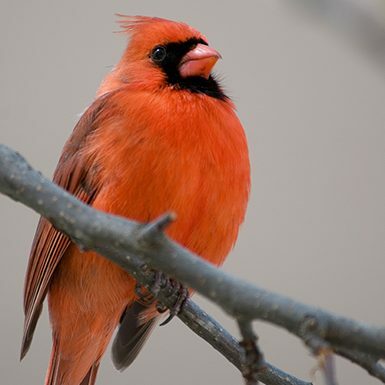 You may experience a week or more when almost no birds show up at your feeder. This is a normal occurrence and should not be considered an indication of some environmental problem affecting the health of the local bird population. So if you have a desire to get more involved with the birds in your yard, follow these few simple guidelines and let the enjoyment begin. Come #birdthepreserves with the FPDCC; view the list of upcoming events for free events near you.